It's time to assemble five new miniatures and get them ready to send off to America for January's Florida exhibition. Handing-in-day for the MASF always coincides with the handing-in-day for the Royal Society's show in London. I try to show all new miniatures each year for both exhibitions, so apart from a couple of commissioned miniatures which I borrow back from the owners it's been quite a busy time. For the first time in Florida there's a special category for cats - both domesticated and wild. 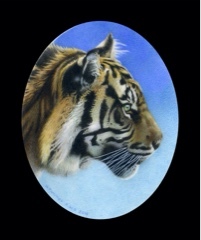 So having visited Longleat Safari Park recently and seeing the tigers there I painted this little profile last week. Although I normally paint portraits this big cat was fun to do. 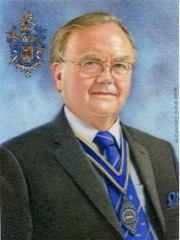 A few weeks ago Professor Brian Livesley - a prominent member of the Worshipful Society of Apothecaries - rang to say that one of the members thought that the miniature of Professor Livesley that I had painted when he was Master had faded a little. As none of my miniatures had ever faded before I was most concerned and said that I would visit Apothecaries Hall when I was next in London. (Incidentally the Professor thought his miniature was exactly as I had painted it). So last Wednesday, on a really rainy day, I took the Phyllis Court coach to London. As I thought there was nothing wrong with the painting at all. But was nice to visit Apothecaries Hall again. (Little bit of history coming up): The Society of Apothecaries traces its origins back to one of the earliest fraternities- the Guild of Pepperers. The Pepperers dealt mainly in spices and peppers, and were responsible for importing, inspecting, cleansing and compounding these items. In 1373 they assumed the title of the Grocers Company, the key word being derived from the fact that the members imported in bulk, that is 'en-gross'. The Company gained its first charter in 1429. Among the members of the Company were the 'apothecaries', who handled not only preparations for medicinal purposes, but also confectionery, perfumes, cosmetics, spiced wines, and similar commodities. Apothecary Wardens had existed among the Pepperers as early as 1328, and when the Grocers Company emerged a substantial number of its members were apothecaries. 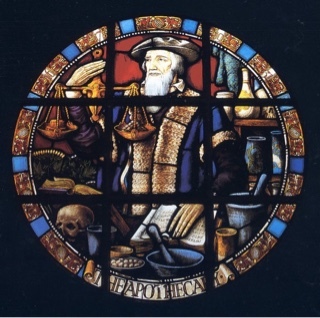 By the middle of the 16th century, the title of 'Apothecary' was restricted more specifically to an individual who specialised in preparing, and selling substances for medicinal purposes. I do enjoy visiting and learning about these traditional Livery Companies. (Only recently I called in to Waterman's Hall to chat with the Royal Bargemaster). My young friend and I had a little trip up the river on Saturday afternoon. Only the second time this year we've been out on 'Marsh Mundy'. But It's finally been fixed now. As we approached Temple Island the only steam-powered umpire's launch was hovering around and we realised they were getting ready to take a new bride and groom for a cruise before ending up for the reception on Temple Island. It doesn't look long enough for an umpire's launch from this angle, but look at it now. The other day I was walking towards Waitrose behind a group of four youths - two girls and two boys. The shouting and swearing I heard was quite disgusting. Both girls were yelling at the top of their voices and using every swear word you can imagine. Everything they shouted was prefixed by the word f******. One girl called the othe a f****** c*** several times. So I just quietly told them to modify their filthy language. Did they stop? Not at all. They just gave me disdainful looks and swaggered on into the store. I did however notice that one of the young men turned round and looked a bit embarrassed. My young friend's garden has matured well in this, it's first real year of life. 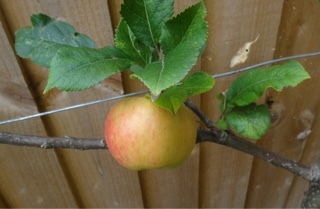 The little apple tree which she bought last year and grew it as an espalier next to the fence produced just three apples this year. (We expect lots more next year). So last week when she tested whether they were ripe, picked one. We shared it. I had my carpets professionally cleaned on Friday. What a noise for a couple of hours! All the furniture was shifted and left with little squares of foil left under all the legs af chairs and tables. (Must be a reason for this). But later in the day I was horrified to see great swathes of carpet looking loose in the living room. Determined to create a big fuss on Monday morning I conjured up all sorts of ways to remonstrate. Then by the time I returned home on Saturday evening it had become perfectly flat again. I must curb my worrying tendencies! 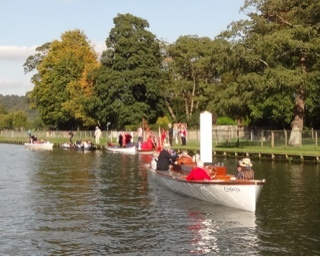 The annual Henley Literary Festival is here. 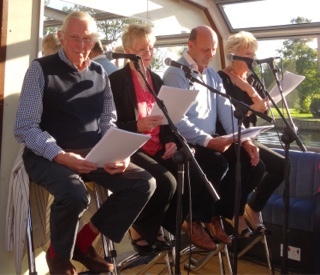 One of the events I really enjoy is a one hour trip on the boat Hibernia where we are treated to a quartet of actors giving readings of poetry and prose as we cruise along the river. Today was the first day of the festival and Val and I boarded the boat in glorious sunshine in the afternoon. Headed by actor Jeremy Child and accompanied by Sally Nesbitt (the daughter of Lord Hunt - leader of the fist ascent of Everest) and two other prominent stage personalities we set off. Readings ranged from John Mortimer and Oscar Wilde to animated renditions from 'The Wind in the Willows' and 'Gigi'. A fund of humorous and sometimes racy poems delighted the thirty strong audience. A very happy hour was enjoyed by all as the boat took us around the islands by Marsh Lock and down river to Temple Island. The narration of the scene from Wind in the Willows where Ratty appears to Mole staggering under a large picnic hamper reminded me of our somewhat similar excursion yesterday afternoon in my little wooden dinghy. 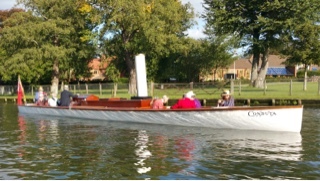 My young friend sat in the stern guiding the boat as I handed her a small can of Pimms and a few cheeselets as we made our quiet and happy way towards and around Henley bridge. The difference to Ratty, however, was in our choice of refreshments. His hamper contained cold chicken, cold ham, cold tongue, cold beef, pickled gherkins, salad, French rolls, cress sandwiches, potted meat, lemonade, ginger beer and soda water. Whew! Next time we'll do better than cheeselets and Pimms.